Wishing you took advantage of the opportunity to have orthodontic treatment when you were younger? Do your crooked teeth have a negative impact on your life and affect your confidence? If you’ve answered ‘yes’ to any of these questions, our Quick Straight Teeth (QST) service may be just for you! Quick Straight Teeth is a way of straightening teeth without the application of metal braces – something that always puts us off getting our teeth fixed! Instead of metal train tracks, you’ll have the choice of removable or fixed braces – depending on your requirements and preferences. Of course, the treatment isn’t referred to as quick without reason. QST treatments can correct your teeth in just six to eight weeks, making it the perfect choice for those of you wanting that picture-perfect smile for your next big occasion. While in demand, Quick Straight Teeth is actually only offered by a few specialist dentists in the UK – AP Smilecare being one of them. Fixed braces are always a great option for those of you that want fast, long-term results. Fixed braces have a reliable and proven track record worldwide for their performance. Best of all, the QST braces have the added benefit of being nearly invisible once placed in the mouth. Fixed QST braces are traditionally only used on the front six to eight teeth, to correct mild misalignment and give you a beautiful smile. If the thought of a fixed brace still concerns you, we also offer the option to choose removable braces – meaning you can take them out should a special occasion arise. 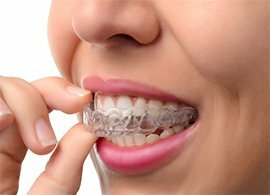 The clear teeth-straightening system uses a series of nearly invisible braces, meaning friends, family and colleagues will never have to know about your treatment. Our removable braces have been developed to be a quick, discreet and very cost effective alternative for patients who do not want traditional metal braces. Why opt for Quick Straight Teeth? Traditional braces can take months, or even years, to correct misaligned teeth. What’s more, they’re not exactly made to increase your confidence! QST is the perfect solution for adults who feel like they missed out or are too old to have braces fitted. Thanks to their six to eight week turnaround, they’re also an ideal solution for anyone looking to improve their smile before an upcoming event, such as a wedding or birthday. The process of getting QST braces fit is remarkably simple. On your first visit, you’ll have an assessment to make sure your gums are healthy and to look at how your teeth could be better aligned. We’ll also take impressions of your teeth, so that a completely bespoke brace can me made to suit your mouth. The fitting itself, which will be a few weeks later will be easy and pain-free. We’ll arrange to see you in a few weeks time to review movement, make any necessary changes and see how you’re getting on. Once satisfied, we can remove your QST braces. To find out more about our QST service, give us a call today on 01254 297 000.